Lunar Eclipse Is When The Moons Moves In Front Of The Earth. A Lunar eclipse is when the Sun, Earth and moon align. A Lunar eclipse refers to the phenomenon of one body passing into the shadow cast by another body. A lunar eclipse in astronomy, is the best-known type of eclipse. A lunar eclipse occurs whenever the Sun, Earth and Moon line up exactly. If this occurrence is at the time of a full Moon where the Moon passes through the Earth's shadow, it is called a lunar eclipse. The type and length of a lunar eclipse depends upon the Moon's location relative to its orbital node. If the lining up of the Sun, Moon and Earth occurs at New Moon, the event is usually referred to as a solar eclipse (although the term is a misnomer and can more accurately be referred to as an occultation of the Sun by the Moon). The next total lunar eclipse will take place at 23:22(UT) on March 3, 2007. A penumbral eclipse occurs when the Moon only passes through the Earth's penumbra, the outer portion of the Earth's shadow. The penumbra does not cause the noticeable darkening of the Moon's surface (though some may argue it turns a little yellow). A special type of penumbral eclipse is a total penumbral eclipse. At a total penumbral eclipse the Moon is completely in the penumbra of the Earth, but not in the umbra. At a total penumbral eclipse the parts of the Moon closest to the umbra are a bit darker than the rest of the Moon. Total penumbral eclipses are a rare type of lunar eclipse. A total lunar eclipse occurs when the Moon travels completely into the Earth's umbra, the dark inner portion of the shadow. The Moon's speed through the shadow is about one kilometer per second, and the totality may last up to nearly 107 minutes. However, the time between the Moon's first contact with the shadow and last contact, when it has completely exited the shadow, may be up to 6 h 14 min or so. 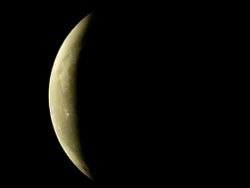 If only part of the Moon enters the umbra, it is called a partial lunar eclipse. Because the Moon's orbit around the Earth is inclined 5º with respect to the orbit of the Earth around the Sun, lunar eclipses do not occur at every full moon. For an eclipse to occur, the Moon must be near its orbital node -the intersection of the orbital planes. Passing through the shadow at or very close to the node results in a total or partial eclipse. The relative distance of the Moon from the Earth at the time of the eclipse can affect the eclipse's intensity. 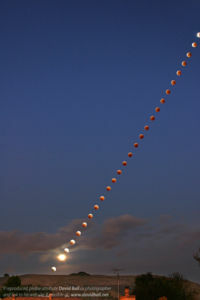 Specifically, a totally-eclipsed Moon being concomitantly at or near apogee will lengthen the duration of totality for two reasons: first, the Moon will appear to move more slowly across the umbra, and second, the Moon will appear smaller as seen from Earth and therefore remain inside the umbra longer. Every year there are at least two lunar eclipses. If you know the date and time of an eclipse, you can predict the occurrence of other eclipses using eclipse cycles. Unlike a solar eclipse, which can only be viewed in a certain relatively small area of the world, a lunar eclipse may be viewed from anywhere on the night side of the Earth. If you were on the Moon's surface during a lunar eclipse you would witness a solar eclipse, with the Earth passing in front of the Sun. Two total lunar eclipses occurred in 2003. The eclipse on May 15 grazed the northern edge of the earth's shadow, and the eclipse on November 8 grazed the southern edge. These images show the eclipse in November was much brighter as the bottom rim of the Moon did not darken as much after completely entering the umbra. The color and brightness of the Moon during an eclipse varies according to the amount of light refracted by the Earth's atmosphere. Date Duration of total phase. The longest total lunar eclipse between 1000BC and 3000AD took place on May 31, 318. 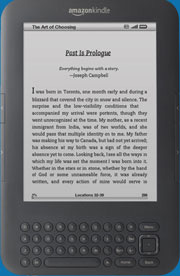 Its total phase had a duration of 1h47m14s. History of the lunar eclipse. A partial lunar eclipse, 07.09.2006. 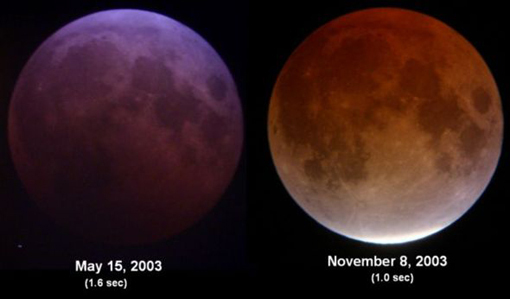 Lunar eclipse of October 2004. The earliest recorded lunar eclipse occurred on 19 March 721 BC, as described in Ptolemy's Almagest, based on Babylonian sources. Ancient Greek Astronomers noticed that during lunar eclipses the edge of the shadow was always circular; they thus concluded that the Earth was spherical. In 499, Indian mathematician Aryabhata gave accurate calculations for both the solar eclipse and lunar eclipse. In 1504, while stranded on Jamaica, Christopher Columbus "predicted" a lunar eclipse (actually, he knew from celestial tables that he had brought with him that a lunar eclipse was to occur on February 29 of that year), thereby intimidating the island's natives into continuing to provision him and his men and thus saving them from death by starvation.